Villery & Boch’s new DirectFlush Subway 2.0 sets a new generation of toilet standards. Complete with an innovative open rim and impeccable modern design which can easily be incorporated into any bathroom, the brilliantly designed DirectFlush Subway 2.0 is ideal in all aspects. With new its new DirectFlush innovation, Villeroy & Boch have set high flushing standards. A standard toilet bowl consists of having a closed rim along the rim of the bowl. Closed rims are fully concealed, meaning it’s harder to reach when cleaning, making it easier for germs to accumulate. The innovative open rim on the DirectFlush Subway 2.0 allows for effortless cleaning, ensuring that impeccable hygiene can easily be achieved. Open rim toilets drastically decrease the chance of dirt and bacteria developing than compared to a closed rim design. Combined with precise direct flushing, the open rim provides a stable water flow dynamic around the rim of the bowl, allowing for truly amazing flushing technology without any excess splashing and spilling. On a standard rimmed toilet bowl the rim is usually fully concealed, therefore it’s harder to reach when cleaning, making it easier for germs to accumulate. Whilst toilets with no rim can be easy to clean, the water flow for flushing usually is not ideal. This is because there is no limit at the edge of the bowl and the flushing effect is often insufficient. Once again, Villeroy & Boch came out on top with their unique and innovative designs. The new DirectFlush Subway 2.0 proved to be the best in the ‘flushing performance category of rimless toilets’. 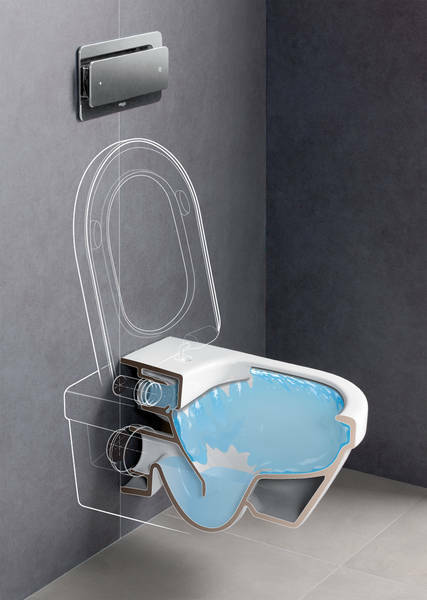 The test was commissioned by Villeroy & Boch and involved carrying out tests on nine rimless toilets by various manufacturers, with the categories consisting of “splashing” and “surface” flushing. The DirectFlush Subway 2.0 came out best, and demonstrated the most thorough flush, as well as being the only toilet not to splash and splurge. As well as having innovative flushing technology, the DirectFlush Subway 2.0 only uses the ideal water flow for the ideal flushing action. Each flush only uses 3 to 4.5 litres of water, making it both economical and practical. The DirectFlush 2.0 can be universally applicated, and is available in the design of the Subway 2.0 and Omnia Architectura collection. This entry was posted in Luxury Bathrooms, Sustainability, Villeroy & Boch and tagged DirectFlush, Toilet Flush System, Villeroy & Boch. Bookmark the permalink.